Craft Time and Cupcakes: Merry Christmas!!! It's finally here! After all the shopping and crafting, it's time to celebrate Christmas. 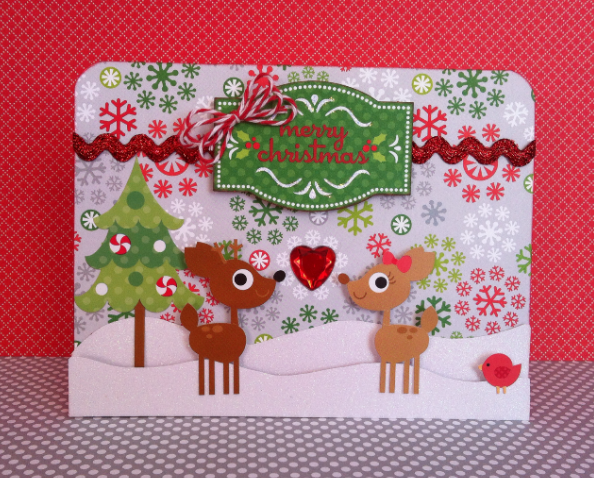 I made this cute card using Doodlebug Designs North Pole collection and features Berry Red Trendy Twine. This has got to be my favorite holiday card I've done this year. I hope you like it too! I want to take this opportunity to thank Lesley for giving my first design team experience with Trendy Twine. I am so happy you gave me a chance to work with your wonderful products. I am sad the term is coming to an end and a new team will take over but I am thankful we are friends and you introduced me to a great group of ladies. I'm always here when you need a designer! To all my followers, I wish you all a very Merry Christmas. Thank you for liking what I do. You have made 2012 a great year for me. Now let's bring on 2013 and great new projects! Have a great crafty Christmas! Adorable. I hope you had a Merry Christmas with your family. Adorable deer! I love the paper colors too. Great job!